Since I have read, to date, every single one of Julie Klassen’s novels, I was highly anticipating Lady Maybe, which just released last Tuesday. Can I just say, it did not disappoint. I have never read a novel that intrigued me more. Clearly the description arouses your curiosity with every word, so it’s no surprise that the book does the same. You cannot help but devour each chapter as each one leads you to the next, making you long to know what will happen next. And let me assure you that Lady Maybe is not in the slightest bit predictable. But I loved it for that. Now, I long to rave about my favorite characters, but I fear spoiling all the surprises. So, let me just say, there were many characters I did not like. Although I liked the way Julie portrayed them and found them excellently written, I cannot say I did not almost hate them. They just got in the way, were completely ridiculous, or caused pain to the characters I did love in a way that I found absolutely unforgivable. Obviously though, my hatred stems from the fact that Julie knows how to create such believable antagonists. Then there were the characters I loved. There was one, in particular, that—despite his seemingly gruff exterior—I completely fell in love with. There was just something about him that drew me to him, and had me championing his cause almost from page one. I’m sure you’ll understand once you start this book. He just…I don’t know…had me sighing from the moment I met him. Although I’m not exactly sure why I fell so hard for him, maybe it started as sympathy because of all Julie put him through, I know that he has become one of my favorite male characters. 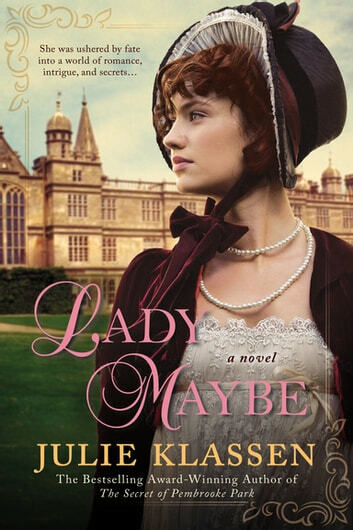 Anyway, this book knocked me off my feet with its compelling story, and the way it perfectly portrayed regency England. I felt transported back to the time and place, and found it difficult to remember where I really was. Since it aroused my curiosity with each new twist and turn, I read the whole novel in just a few hours, and now am ready to pick it up and read it again. Instead, however, I have decided to lend it to a couple of friends. After all, I did receive it the day it released, read it in its entirety the day after, and find it to be one of my favorite books in all the world. How could I not share something so new and wonderful with my reader friends? So, if you haven’t figured it out by now, this novel easily earns all five bookshelves, for being absolutely unforgettable. I know that it will be a book I will be eager to read again and again, and it makes me even more excited as I anticipate the release of her next novel, The Painter’s Daughter, which releases in December. Believe me, I’m already planning to pre-order it. Not only am I sure to enjoy it, I’ve also possibly gotten addicted to pre-ordering. There is just something about getting a book in the mail the day it releases. Anyway, I highly recommend you read this book as soon as possible. It is well worth it.